I’ve been puzzling through something from the June 9 materials for some time: what happened with Ike Kaveladze’s missing suit? Or rather, what does the exchange about his missing suit with his daughter suggest? I’ll get to the suit in a bit, but first some background. Back in January, I suggested the well-orchestrated public narrative about the June 9, 2016 Trump Tower meeting was a limited hangout. The public narrative fed by defense attorneys (above all, Agalarov lawyer Scott Balber, representing Ike Kaveladze and with him the Agalarovs) never explained why Crocus Group Vice President Kaveladze jumped on a plane from LA to NY — with just two days advance warning — for the meeting. Additionally, the public narrative at least hinted that there was a later part of the meeting not covered by the public narrative. The materials released by the Senate Judiciary Committee are crystal clear on the first point: Kaveladze, not Rob Goldstone, was actually in charge. Kaveladze describes meeting with Natalia Veselnitskaya before the meeting, and vetting her presentation for his boss, Aras Agalarov. My purpose [in attending the meeting] was to read that longer synopsis, whatever she had over there, and my understanding was that longer synopsis contained something which I could alarm Mr. Agalarov about — you know, I would alarm him, and he would call off the meeting. That synopsis was about same thing [Magnitsky], so there was no alarm or nothing. Kaveladze would again be managing Vesenitskaya later in the year, in a bid to get the second meeting Don Jr had tacitly offered, until he finally handed her off to Balber in January 2017. And a year later, when things started to blow up, Emin Agalarov described that “the meeting happened through Ike and my dad,” something Rob Goldstone — who has always gotten public credit for arranging the meeting — happily agreed with. It was always clear (indeed, Vesenitskaya said so explicitly) that Aras was really the one behind the meeting. Kaveladze’s role in the meeting only reinforces the point. Yet that’s a point that the public narratives — the narratives fed by those who set up the meeting — have all obscured. As for the second question, whether there was a second part of the meeting, the materials allow for the possibility of either Goldstone staying behind or Kaveladze returning upstairs for a follow-up. In his testimony, Kaveladze provides a clear description of Goldstone staying behind, and even suggests that’s the only possible time VKontakte, which Goldstone described discussing with Don Jr and Trump in a June 29 follow-up (PDF 20), could have come up. In any case, by Kaveladze’s account, Goldstone did not accompany the rest of the group when they went to the lobby bar for a drink afterwards. Q: To the best of your recollection, did Mr. Goldstone discuss this VK proposal during the June 9, 2016, meeting? A: No, unless he stayed after the meeting. Q: Did you not leave the building with him? Did he remain behind? A: No, I left the building with Natalia Veselnitskaya, Anatoli Akhmetshin — Anatoli Samochornov and Rinat Akhmetshin. A: Correction, correction. We didn’t leave the building. We walked into a Trump bar which was located inside of the building, and after a round o f drinks, I left the building myself. They stayed in the bar . Goldstone’s account deviates from the others’ in another way: he doesn’t mention Ivanka’s presence in the upstairs lobby as the group was leaving, even though his December 15 interview took place after all the others’, which were in November (this is a topic that Mueller brought some witnesses back in for second interviews about). Kavleadze lays this all out very clearly, thanks to the intervention of Balber, who scripted so much of this story. MR . BALBER : One more question before you leave this topic. Was there anybody you met in the kind of reception area as you were leaving the meeting? MR . KAVELADZE : Yeah. We were greeted by Ivanka Trump . Q. Was she ever present in the meeting? A: No . She was at the reception. She said hello to us, and we said hello, how are you, and we had, like, polite conversation for maybe 1 minute. And then she told us to have a good day, and we left. Akhmetshin reports that they spoke “for like 3 seconds.” Samochornov describes only seeing her pass through the lobby without stopping. That says that if someone stayed behind, it’d have been Goldstone, by himself. All that said, given that the meeting after the event took place at the bar in the Trump Tower lobby, it’s possible Kaveladze went back upstairs after speaking to Aras by phone. Kaveladze’s narrative has him going to the lobby bar with Veselnitskaya, Samochornov, and Akhmetshin for 15 minutes, receiving a call from Aras, and then leaving. MR . FOSTER: Okay. So after the June 9th meeting, you talked about how you went downstairs to the bar on the lobby level of the Trump Tower, and you were there with three other people — Ms. Veselnitskaya, Rinat Akhmetshin, and Mr. Samochornov. Q. Do I have that right? A . I think Samochornov left slightly earlier, like – – but I’m not sure about Samochornov because — or maybe he stayed, but, yeah , those — we walked all together and then some of them — and I left in 15 minutes. Q. And you had a round of drinks with them, we saw. Do you recall what conversation you had during that round of drinks? A. Mostly about meeting, and out of that 15 minutes, probably 5 minutes I spoke with Mr. Agalarov, and for 10 minutes it was I think they were satisfied with the fact that Mr. Junior has suggested that it might be a second meeting if they win. And so they were talking about that, you know, to prepare for that second meeting. Q. What did you discuss with Mr. Agalarov? A. In general , the meeting went well. Oh good. Then Natalia asked for the phone, and I passed the phone to her, and she kind of thanked him for helping to organize that meeting. Q. Did you say anything to Mr. Agalarov about the matter that had given you some concern earlier, the potential information about Hillary Clinton? A . No, I didn’t discuss it over the phone. A. I stayed there for, like I said, 15 minutes. No, I don’t think we discussed anything else. Q. Did you all leave simultaneously? A. No. I left first. This would have been around 5:20, given that Agalarov somehow knew the meeting would be done and called to check in at 5:14. Q. He called you? Okay. I’m sorry. He called you. How did he know — do you know how he knew to call you after the meeting? How would he have known the meeting ended? A. He gave it a try. What he does for the next 24 hours is of interest for several reasons. Most of all, it’s interesting because in his first appearance before SJC, Kaveladze neglected to tell the committee that he went from his trip to NYC (for which he got 2 days warning, remember) directly to Moscow to meet with Agalarov, with whom he discusses matters of import face-to-face because, “Agalarov is based in Russia, and I’m pretty sure, you know, his phone is being, you know, monitored.” So his original story is he flew to NY for the meeting, then returned to his home in LA the next day. Q. What was your itinerary while in New York during this trip? A. I stayed for one day, and I returned back home on June 10. My itinerary included only one item as a meeting actually, two items. There was lunch with Natalia Veselnitskaya prior to the meeting and then meeting itself . Q. And so you left the next day on June 10th? Q. Where did you fly to? After some questions about both his phone records and email traffic from SJC questioners, Kaveladze admits that he might have traveled elsewhere in June, but would need to check his records for travel reservations (he claims he doesn’t keep a calendar). In February, as part of submitting errata to the transcript, Balber would alert the committee that Kaveladze had actually traveled to Moscow for over a month-long trip on June 10 (though even after consulting travel records, couldn’t reveal when he had returned). Before he did that, though, this was this explanation (save his phone traffic, which I’ll get to) from his first appearance that Kaveladze offered for the balance of his time in NYC. Q. So I believe you said you left on the morning of the 10th; is that correct? Q. After leaving the Trump Bar, what did you do with the rest of the day? A. I do not recall. I might have some meetings with my friends, but nothing business related. Q. Did you discuss the Trump Tower meeting with any of those friends, to the best of your recollection? A. I don’t even remember if I had a meeting with friends, so I definitely don’t remember discussing it with them. I think I was kind of tired because of a jet lag, because it was a red eye flight I arrived on, and I went to bed really early. Given that Kaveladze flew through Frankfurt, and flights from NYC to Frankfurt start after 4PM, he probably remained in NYC through the afternoon of June 10, a full 24 hours after the Trump Tower meeting. Is it correct that you departed New York City for Russia on June 10th, 2016, the day after the Trump Tower meeting? A. To be more specific, I departed — on June 10, I have left New York City for Frankfurt, Germany, and I believe I arrive to Moscow on June 11. One thing we know he did in that 24 hour period was talk to Goldstone. After some dodging, he admits that a call placed to him at around 6:51PM on June 9 must have come from Goldstone, but he doesn’t recall what was said. Q. Okay. Do you recall whether you did speak to Mr . Goldstone after the June 9th meeting by telephone? MR . KAVELADZE: I don’t have a recollection of that phone call. Goldstone, however, remembers calling him in an angered state. Q. Did you have any other conversation with him after the meeting, in the immediate time after the meeting that day? A. I — I believe I would’ve spoken to him by phone later that day, in a sort of angered state. So Kaveladze spoke to Agalarov right after the meeting, and then sometime two hours later, spoke with Goldstone, who was probably working on the letter he’d send Rhona Graff the next day at 3:41 (PDF 30), a follow-up on the exchange he had with Keith Schiller at Trump Tower about how to send Trump a gift the next week. According to the version presented at his first appearance, Kaveladze then spoke to Agalarov again. Curiously, even within that first appearance, he offers conflicting evidence about whether he spoke with Agalarov by phone once or twice on June 9. Q. Okay. So you didn’t do any sort of report after the meeting back to your boss, “Here’s what I did”? You didn’t write a memo? A. No. Just a phone conversation. Two of them, to be specific. Q. And do you recall when those were? A. One was within 30 minutes after the meeting ended, and the other one was within 2 to 3 hours after the meeting ended. Q. Can you describe them to the best of your recollection? A. As I mentioned before, the first one was basically me reporting that the meeting went well, and the reason I said that because Natalia Veselnitskaya was right next to me. And the next one I said it was complete loss of time. This comes up again later in the interview and Balber carefully coaches Kaveladze to distinguish the first conversation, for which there would have been witnesses, at which he said the meeting went great, and the second, when he said it was a “loss of time,” using the same exact phrase both times. Q. Did you report back to Aras Agalarov about the meeting? Q. How did you describe it to him? MR. BALBER : Was there a prior conversation, though? MR. BALBER: Why don’t you run through both the conversations. The thing is, I don’t believe the second phone call shows up in Kaveladze’s phone log (they’re totally redacted, starting at PDF 50, but there’s no discussion of a second call while he’s in NY as they review his call logs). Though if a call or other communication occurred two hours after the meeting, it may have shortly followed the call from Goldstone. Goldstone, incidentally, also says they exchanged a WhatsApp or other text during the meeting which remained, as of his testimony, undiscovered. In Kaveladze’s second appearance, he changes his testimony and says no recollection of “that” phone call (which given his imperfect English could mean either the phone call he had described previously, or the notion of an additional phone call). Q. When you were before the committee a couple months ago and testified previously, we had asked you about a telephone conversation with Aras Agalarov, and we had shown you a telephone bill that showed the time of the call was 5:14 p.m. on June 9th after the meeting . In between that telephone call and your arrival in Moscow, did you have any other conversations that you can recall with Mr. Agalarov? A. I have no recollection of that, conversations. But Kaveladze does admit a face-to-face meeting in Moscow. Q. Was anyone else present for that meeting? A. Not for that topic. I mean, I had met we had like a private meeting, but you know how there is like — there is like a big room, and there is like people getting in for different issues, and I had like — I had 2 minutes o f his privacy and had this quick conversation. Q. And with respect to that conversation, as it pertained to the June 9th meeting, was anyone else participating by telephone? Or was it just you and Mr. Agalarov? A. Just me and Mr. Agalarov. Q. Do you recall anything else from that conversation, other than having reiterated your belief that it would’ve been better to have Ms. Veselnitskaya meet with lawyers? So that’s the story: he oversees a meeting, has a short round of drinks, gets a call from his boss, whom he tells everything went swimmingly in spite of the disappointment around the table. Goldstone calls him later that night, he may have another chat with his boss. And then the next day — a day he originally didn’t admit to — he hops on an initially undisclosed flight to Moscow, where he can explain what went on in the meeting to Agalarov face-to-face. Before he leaves, though, he makes three more phone calls, one to (we learn later) somewhere in NY, and two more, at least one to a Russian mobile phone. Q. So let’s take a look now at Bates page 282, and you’ll see that this is showing call details for your telephone number. Do you see that? Q. At the top of the page, it your telephone number. So I want to point you to June 10th, and you can see the first call on June 10th is at 10:34 in the morning. Q. 10:34. Two numbers down below that, 12:36 and 12:48, do you recognize either of those telephone numbers? Q. You can see that the destination for the first one, the one that ends in [redacted], says “Russia MOB.” Do you know what that means? Q. Mobile. And the number immediately below it, the [redacted] number, do you recognize that number? Kaveladze dodges a bit until Balber weighs in and asks if he knows the numbers. MR. BALBER: Okay . The only question is: Do you know the numbers? MR. BALBER: Okay. Then that’s it. MR. KAVELADZE: I don’t recognize the numbers. Q. Would you be able to match the numbers to names in your phone book or your electronic directory? A. I could try. It’s in my phone book. When Kaveladze testifies again in March, however, he has not yet checked any of those numbers. 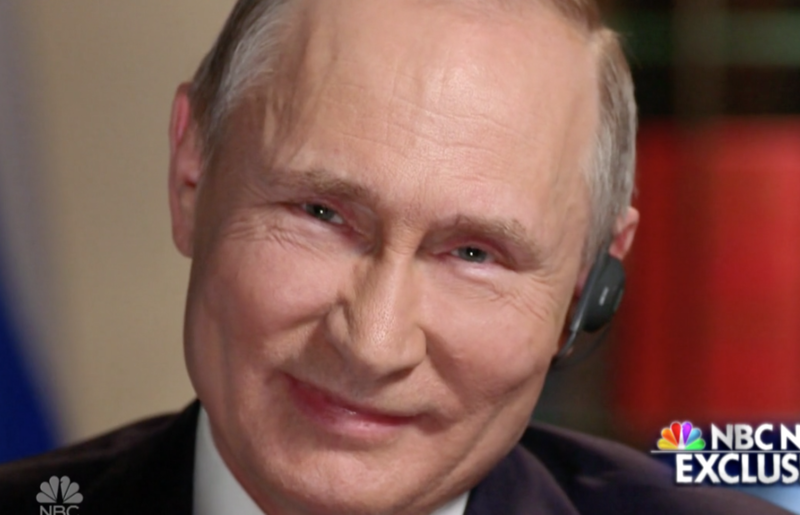 He also remains unsure about who he called from Russia, on June 15 and 16, at least one of which was back to New York (apparently a four character name). That, by itself, isn’t all that interesting. I probably wouldn’t be able to ID the phone numbers I called 15 months ago, cold. Though it does seem that Balber is less than excited about doing the quick check to ID these numbers given that, in spite of a request from the committee, he hadn’t done so for the second appearance. Anyway, did I say that this post was about Kaveladze’s missing suit? With all this as background I want to look at what happens overnight on June 14 and 15, when Kaveladze is in Russia, making those calls to people whose identity he won’t ID. 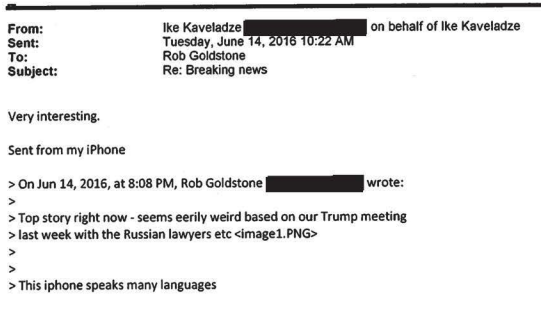 As has gotten some press, on June 14, at around 1:08 PM, Goldstone sent Kaveladze this article, citing Trump’s relationship with Putin, in an email, calling it “eerily weird based on our Trump meeting last with with the Russian lawyers.” Kaveladze replies from Russia at 1:22 ET, 10:22AM PT, or 8:22PM in Moscow. Nine hours (overnight) later, Kaveladze has a curious email exchange with this daughter, starting at PDF 15. First some background. Recall that after Agalarov told Kaveladze to hop a plane to NY, and after Kaveladze learned that Paul Manafort, Don Jr, and Jared Kushner would be at the meeting, Kaveladze called Roman Beniaminov, Emin Agalarov’s business assistant in NJ. He asked, “Do you know anything about that meeting? 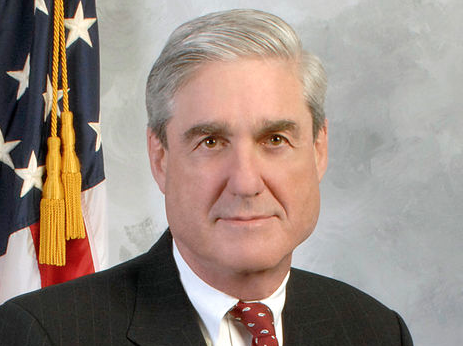 Do you know anything about the fact that we’re going to be meeting with three top political electoral campaign representatives to discuss Magnitsky Act?” To which Beniaminov responded that, as far as he had heard, “attorney had some negative information on Hillary Clinton.” That’s a story, incidentally, telegraphed to the press by Balber after Kaveladze had testified, and after Goldstone had published his rough draft of what he’d testify to, but before he actually testified. 10:49PM daughter to IK: 1. It’s plane 2. AHAHAHHAHAHAHAHAH 3. Did u get the iPad and suite back? 11:19PM IK to daughter: They have sent iPad to my New Jersey office. Suite is gone. 11:23PM IK to daughter: Nice. who is driving u? 11:25PM IK to daughter: are u gonna do all crazy rides? At a minimum, what this exchange did was sustain a conversation long enough such that Kaveladze could leave a record of telling the one family member he was sure (given his other testimony) he had told he was dealing dirt that in fact no dirt got dealt. While Kaveladze may have been swamped once he got to Moscow, I find it interesting that the exchange didn’t happen until six days after he left, and only after Goldstone had raised concerns that just after their meeting, the press reported that dirt on Hillary got stolen by Russia. That is, I think it likely that after Goldstone alerted him, Kaveladze (who is smart enough to know he shouldn’t say anything sensitive to his boss on the phone because it’s probably surveilled) to create a contemporaneous record saying no dirt got dealt — whether it did or not. Which brings us to the missing suit. As best as I can tell, Kaveladze is admitting to his daughter that first he forgot his iPad on the red-eye to NYC on June 8-9, and then admitting he left his “suite” in the hotel room when he left — in no rush at all, because he was in NYC at least until 1PM — June 10. The airline would be able to verify to Mueller that they did, in fact, find Kaveladze’s iPad forgotten in the seat back of his airplane seat and sent it on to the NJ office. That claim is further corroborated (sort of) by the fact that Kaveladze went to a Staples for something on June 9. The reason I find the missing suit as suspicious as his daughter does is because he wasn’t actually, as he originally claimed, flying to NYC for an overnight. I mean, that by itself is sketchy, because if you’re flying an overnight, you bring a change of shirt and underwear and wear the same suit home. But Kaveladze was in fact traveling on to Moscow for a month, with presumably a number of suits. Making it likely you had a hanging bag in the closet right there next to the suit you wore on June 9. If Kaveladze really did have an early morning flight on June 10, I can get how you’d overlook that suit hanging by itself (perhaps you had no reason to don a suit on the 10th, and so wore comfys for the second red eye in three days and left the spare suit in the hotel room?). But he was still on his phone at 12:48, which (even given NYC’s abysmal airport transport options) would allow a quite leisurely trip to the airport. And all that’s assuming that a hotel of the caliber Kaveladze would stay at (with his last minute trips to NYC and then Moscow) wouldn’t make a point of putting the suit aside for safe delivery. So yeah, I’m with Kaveladze’s daughter. The missing suit is weird.